I am a Canadian and proudly so, but it hasn’t always been easy being a fan of electronic music living here. In the late 80s and early 90s I hosted a radio show on the campus/community radio station, one that focused on alternative pop and electronic music, called Industrial Poetry (yeah, yeah, I was young and pretentious…). In Canada radio has to play something called “Canadian content” which translates to a certain percentage of one’s playlist having to adhere to a complicated formula that determines a songs “Canadian-ness” involving a cross-section of artist, producer, songwriter, and other factors (so convoluted that Canadian Bryan Adams had an album out around that time that wasn’t considered “CanCon” because other than his being, you know, “Canadian”, the album (I forget which one, I couldn’t name a Bryan Adams album if my life depended on it) didn’t have enough of the other criteria. I digress (badly). Bottom line was on my show I was fortunate to have the midnight to 2AM slot on Saturday nights, which meant I had to play only 10% CanCon instead of the much higher percentage shows on before midnight had to honour. This translated to two songs a week. And I had a hell of a time reaching even that goal (you can only play Manufacture’s “As the End Draws Near”, KonKan’s “I Beg Your Pardon”, and assorted tracks by Skinny Puppy, Moev and Front Line Asssemby so many times). In the pre-internet days (yes kids there was such a time) it was next to impossible to find Canadian material that would have fit in to the kind of format I played and as a result I developed a passionate negative reaction to the very idea of Canadian music. Canadian music didn’t mean anything I could or would have wanted to listen to. These days I feel spoiled and half wished I still did my radio show. Dragonete, Ayria, Psyche, Conjure One, the Birthday Massacre, even Beast among many more are producing great, high-quality, accessible electronic music. Go Canada! One of the jewels in the Canadian electro crown is Metric. Emily Haines in her many guises never fails to impress but it’s with Metric that her visions are most fully realized. 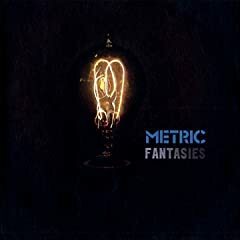 Their new album, Fantasies, is certainly their slickest, and I’d say perhaps their best album to date. Sometimes love the Twitters. News comes from Northern Kind’s tweets that their new album, Wired has dropped with an official launch due May 15 (in the UK at least). Really love this band and truly enjoyed their last effort, 53degreesnorth. A real throwback to Golden Era electropop and looking forward to the new goodies. Also hearing that the lovely and weird Imogen Heap’s new set is finally en route. Scheduled for an August release, Ellipse will follow up the innovative and exciting Speak for Yourself. She speaks about the new material at her vblog where she shares actual song snippets (which are sounding absolutely awesome). Usually a review is largely based on first impressions; one will listen to a new album a few times to get a feel for it and go with one’s gut. But what’s interesting to see if that initial impression sticks. The main reason I wanted to revisit some reviews/first impressions was my sense that I felt let down by Depeche Mode’s Sounds of the Universe. My initial impression was wrapped up in a relief and inherent excitement around their return to form using electronics with a purity they had not in decades. But the more I live with the album the more I am struck by how underwhelming I find the songwriting. Nothing stands out – lots of ‘good songs, Wrong, Corrupt, In Chains, Peace – but nothing that stands as “outstanding”, unique or a serious meaningful addition to the DM pantheon. Initial impression > current impression. 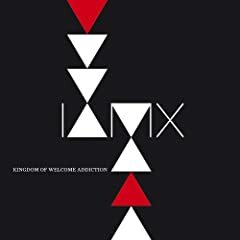 At the same time I was cautiously pleased with the new IAMX release, Kingdom of Welcome Addiction, which was simply “better than I thought/feared it was going to be”. On many, many (many!) listens later, the album feels like such a breath of fresh air, so perfect in tone, so spot-0n in terms of production and songwriting prowess, so emotionally powerful it feels like the album of the year so far. Put on the headphones, crank it up and listen to the title track, or Shipwreck of Life or I Am Terrified, or best of all, Teargarden and tell you you aren’t moved emotionally and even physically by the power of this magnificent album. I was way off base in my lukewarm treatment of the record. Sometimes an artist can slip by me, completely unnoticed for years. 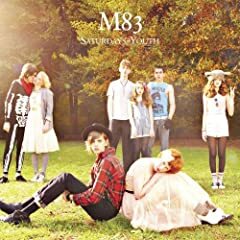 It’s only because France’s M83 are opening for Depeche Mode on the European leg of their “Tour of the Universe” that I’ve heard of them at all. Alerted to their presence with the announcement of a contest to provide a video for their new single “We Own the Sky”, I was prompted to pick up their new album Saturdays=Youth, and I have to say it’s a delight. I’m not going to provide a review because this album has been out since last year and I have pledged to keep all reviews current, but a few words on the band and the album. Around since 2001, they’ve already released five albums and the new(est) one seems the most well rounded. A lot of soft-spoken vocals, and etherial swirling synths with a dollop of early 80s new wave (eg. the guitar line on “Couleurs” sounds like it was lifted from Human League’s “The Lebanon” and there’s more than a little Simple Minds mixed in there). They are awfully self-serious but there’s an element of fun in there too and the band (who is actually, largely founder Anthony Gonzalez) know their way around a good beat and songs like “Up!” and “Kim and Jessie” are rock-solid pop songs. It’s unfortunate I hadn’t discovered this enjoyable band earlier but I’m glad to have so much material to start sorting through now. Our views of albums can be seriously coloured by the expectations game. I think I like the Depeche Mode album in a way I am guessing many mainstream reviewers will not largely because my expectations were not high and they were exceeded. Meanwhile I disliked Goldfrapp’s last album, The Seventh Tree partly because my expectations were sky high following the brilliance that was Supernature. The way we anticipate an album deeply affects how we view said album.